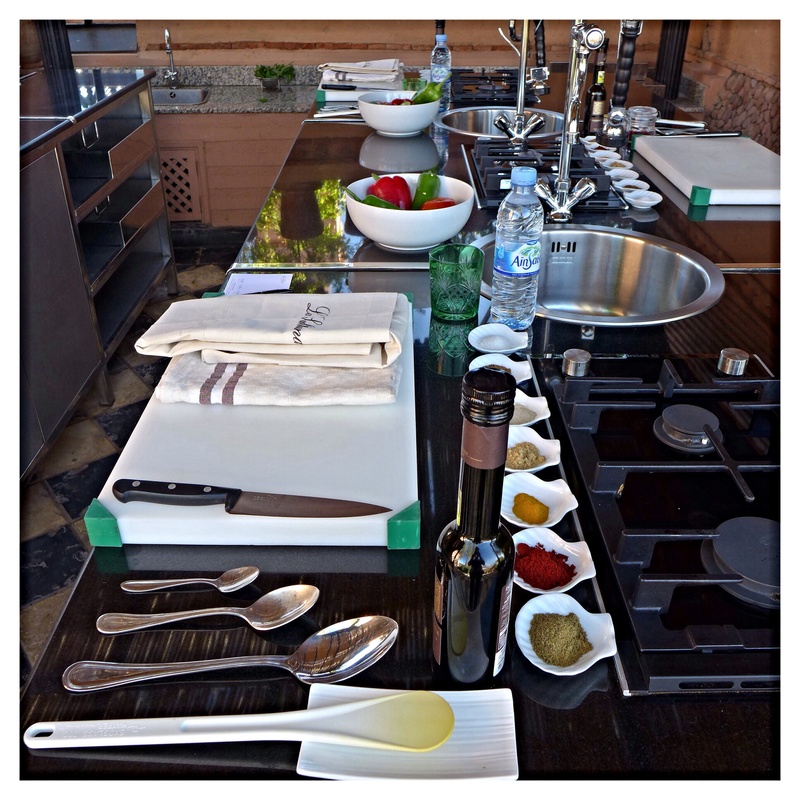 Whilst staying at La Sultana Marrakech, we saw an advert for a cooking class held on site. 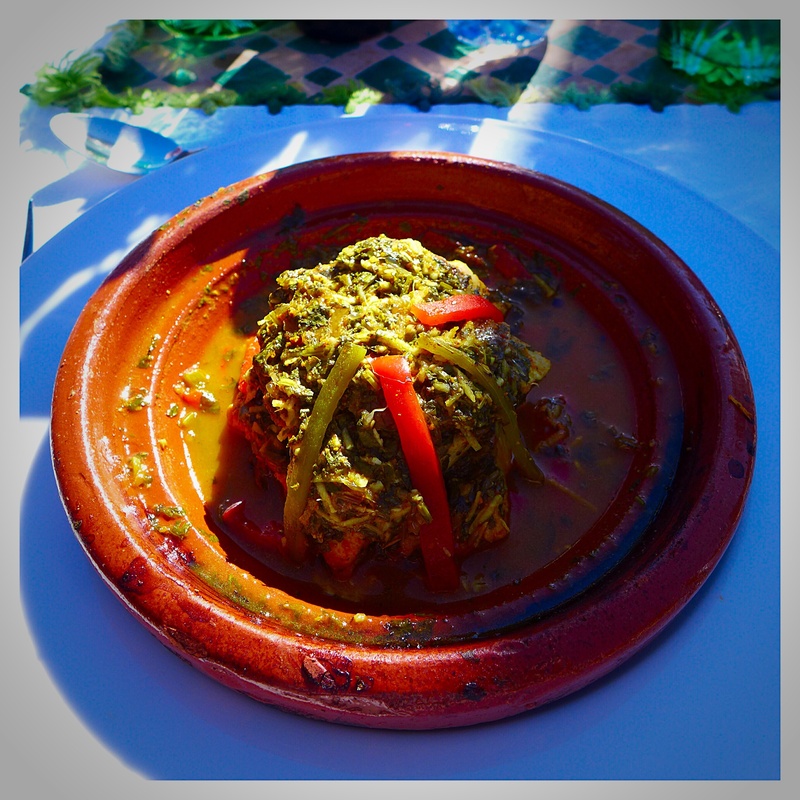 It seemed a good deal and knowing little about Moroccan food, we signed up for some teaching. 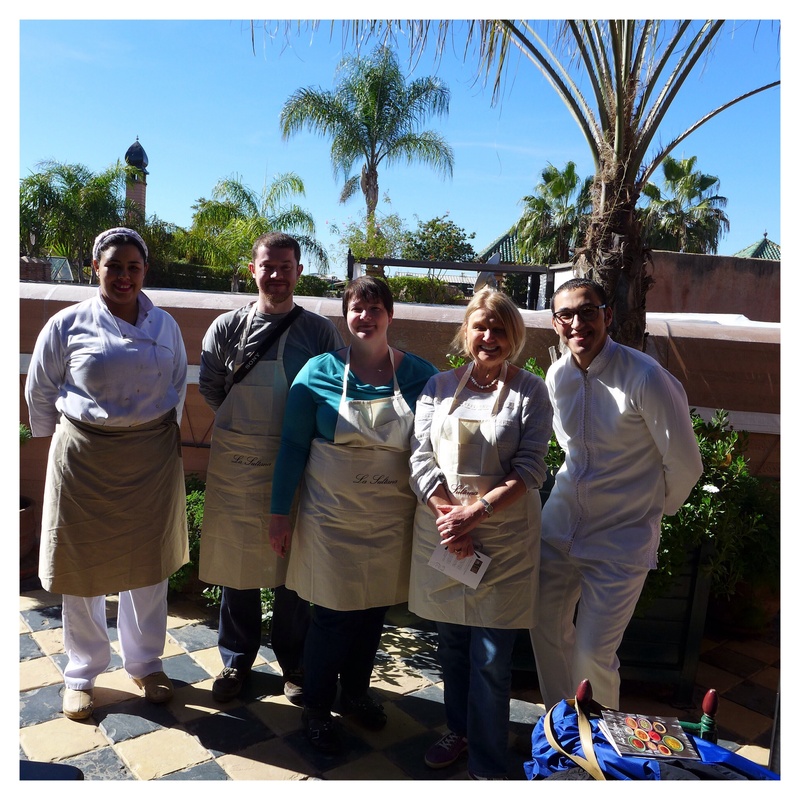 Information on cookery class at La Sultana. The teaching area is on the picturesque roof terrace, alongside the bar, restaurant and sun terrace. 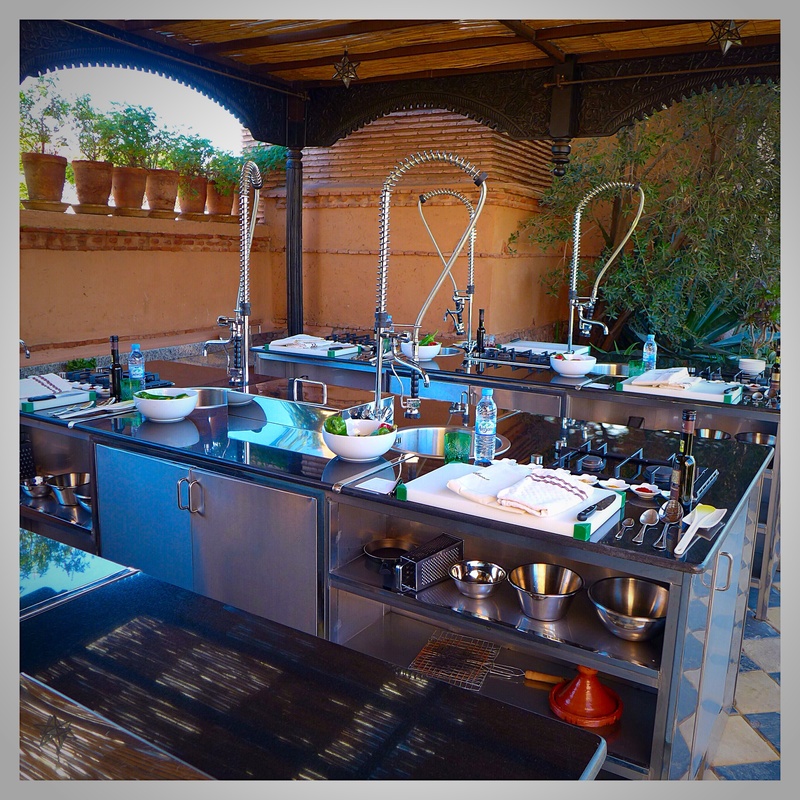 Modern, and fully prepped with all the equipment and spices that we required. 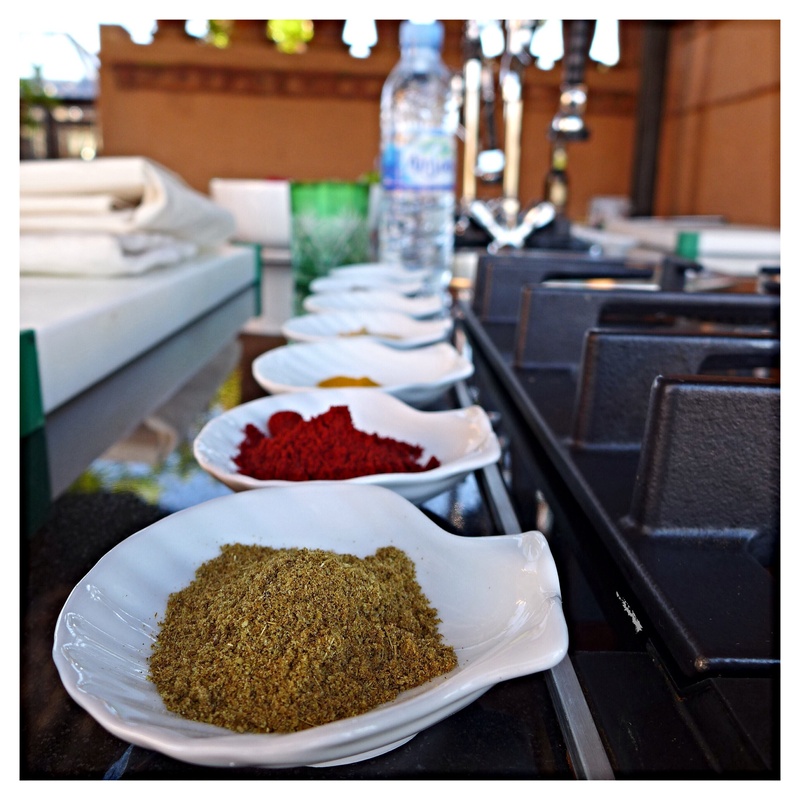 We started off by being introduced to all of the spices, having a smell of them and learning how they add to the flavours of Moroccan cookery. We opted to cook a fish tagine as well as a taktouka salad. 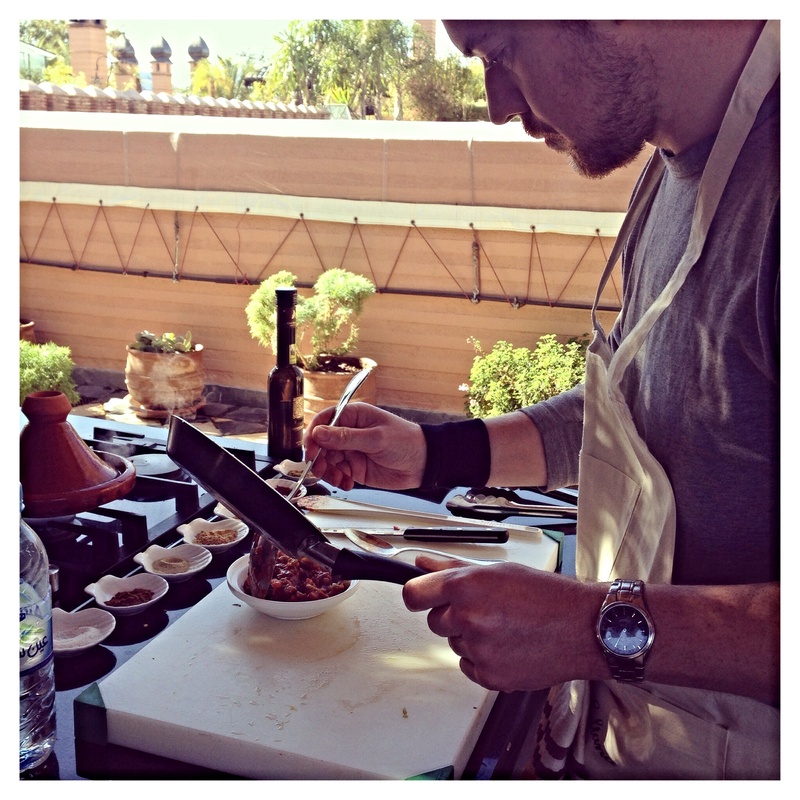 We were certainly put though our paces, skinning peppers, tomatoes and cooking on our grills with our tagine. Thankfully, we had lots of water on hand, but sometimes tea is needed. Whilst the food cooked, we all moved into a cooler area to learn about the tradition making Moroccan mint tea. Moroccan mint tea is Chinese gunpowder tea mixed with lots of fresh mint and sugar, lots of sugar! And then some more sugar! 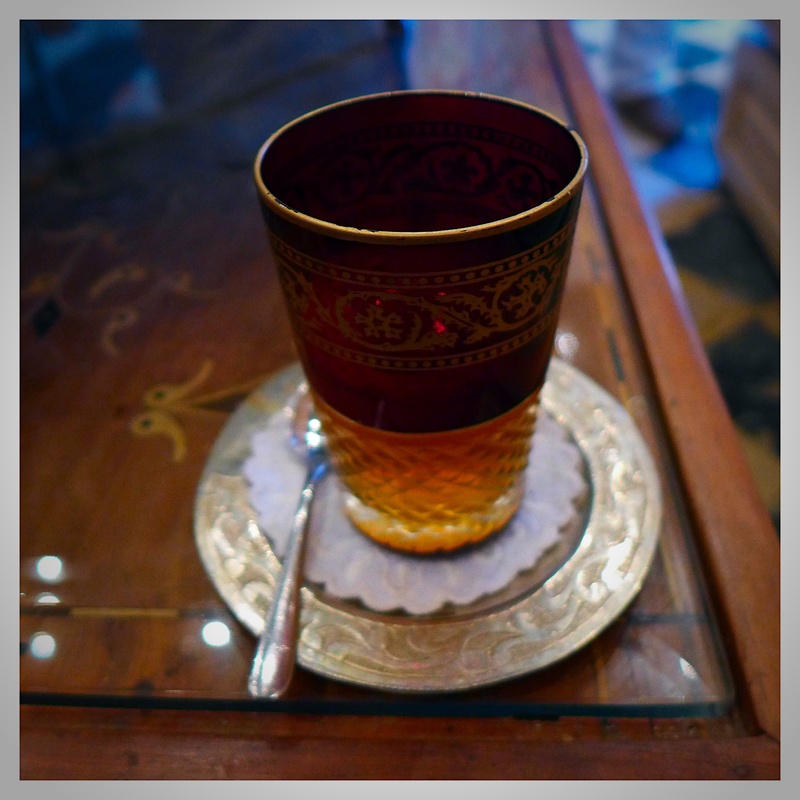 Seemingly the height the tea is poured from relates to how welcome you are, the higher the distance the greater the compliment, which also results in a bubbly tea and we were told that no Moroccan will drink tea without bubbles! 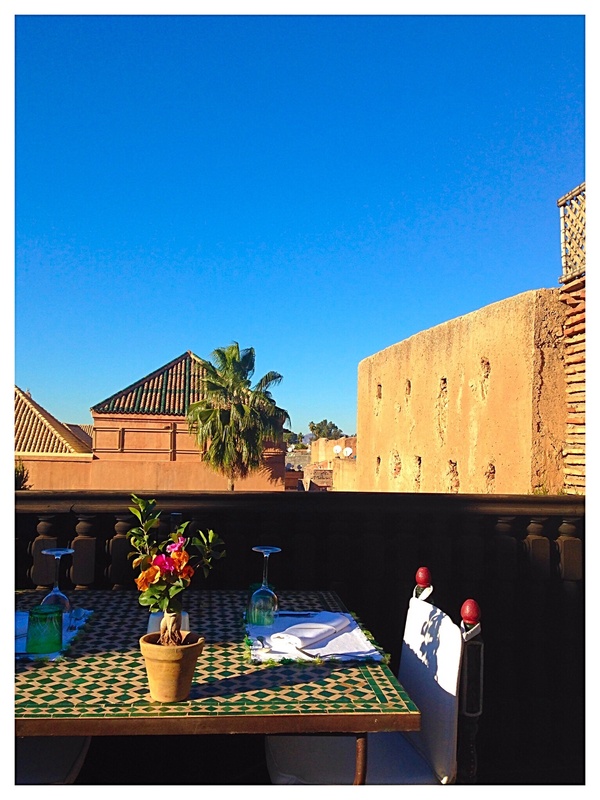 We headed to the restaurant area which overlooks the historic Saadien Tombs. Where better to relax with some freshly made food made by ourselves? We really enjoyed our cookery class. It was informal, relaxed and fun. 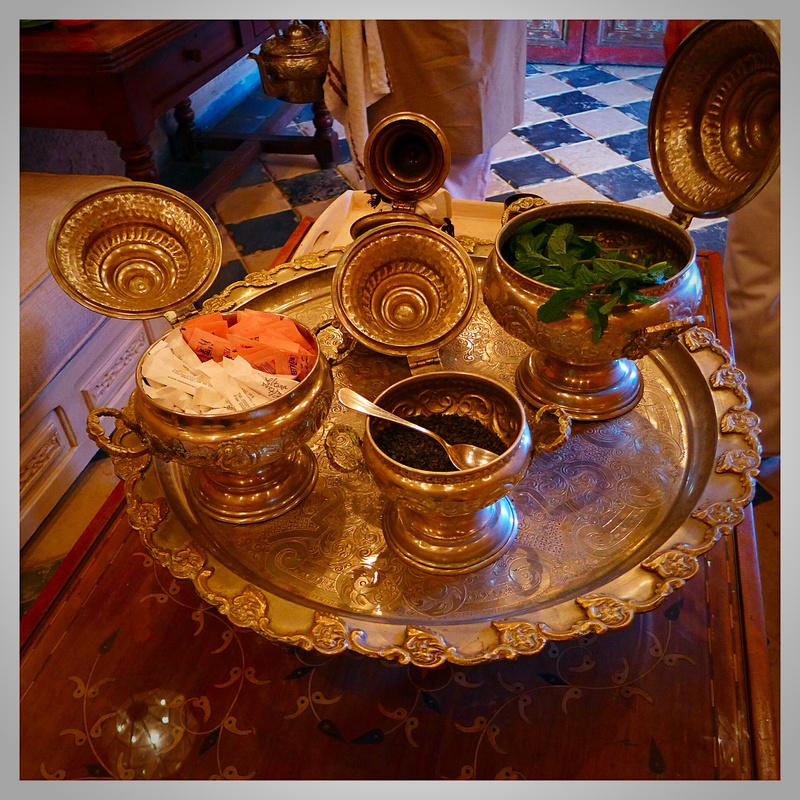 We left Morocco with some knowledge of the cuisine and knowing how to brew and pour the perfect mint tea that we grew to love – it’s everywhere in Marrakech! 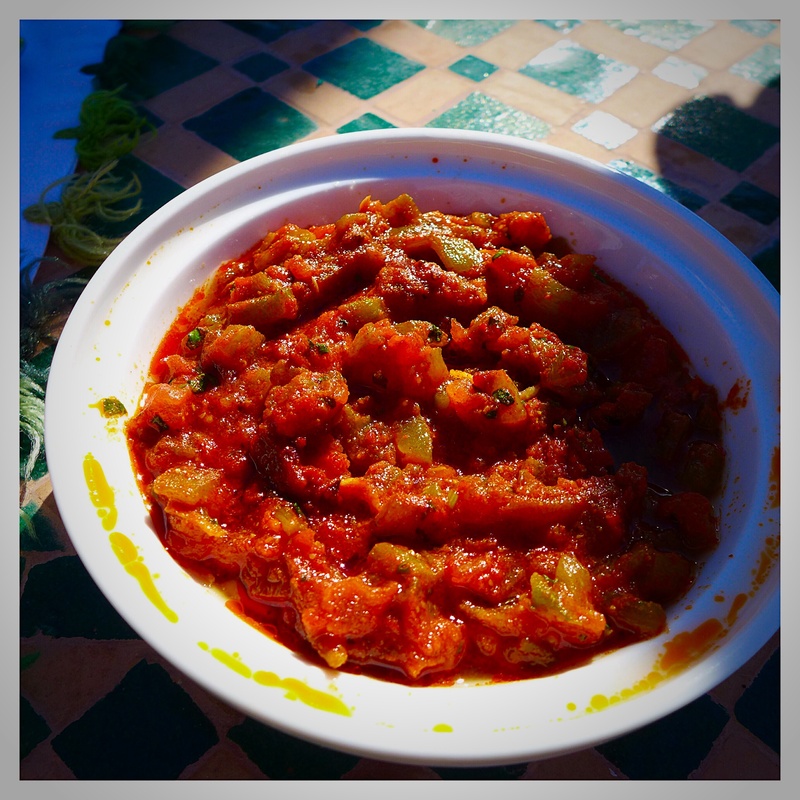 If you would like to cook our Morrocan Fish Tagine at home, the recipe is here. The cooking class lasts approx two hours, which includes time for chatting and eating the finished product. We were shown how to make mint tea and had the chance to relax and chat whilst drinking this too. The class can be booked directly with La Sultana Hotel. Please see our review of the spa at La Sultana here, our accommodation review here and our lunch review here. We've not done any tagine cooking since we came home but we've been drinking a lot of Moroccan mint tea!